It didn’t take long in 2015 for Jack Crisp to limit the pain of losing midfielder Dayne Beams to a bare minimum. After landing at Collingwood as the part of the deal that saw Beams land at Brisbane, the then-21-year-old Crisp was largely an unknown quantity. 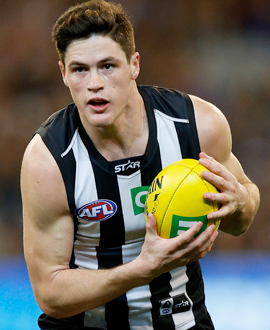 After player just 18 games during three years at the Lions, Crisp found luck under new coach Nathan Buckley and made the trip back to the Sunshine State to play in Collingwood’s round one team. It was a position he took with both hands and refused to let go. Alongside fellow recruit Travis Varcoe, Crisp was one of just four players who played all 22 games for the Magpies in 2015. After starting the season as a forward and part-time midfielder, his role shifted to a permanent, tagging position in the centre. On the more than a few occasions, Crisp not only shut down his opponent, but also won more than his fair share of the football. He set a career-high in disposals with 27 touches in round eight against the Gold Coast, but went on to surpass this on two occasions, collecting 28 against Greater Western Sydney and then 31 against West Coast in round 16. It was the game against the Giants in round 11 that was arguably the best game of Crisp’s emerging career. He was awarded three Brownlow votes for a showing which also produced two goals and five tackles. As the season concluded, the recognitions continued to roll in. At his first Copeland Trophy night in October, Crisp walked away with two awards – the Jack Regan Trophy and the Gavin Brown Award (Leading Desire Indicators).